Jessica Szohr's Plane-Ride Style, Chic or No? Amidst all the blue-eyed blonds we see in Hollywood, Jessica Szohr’s unique beauty really stands out. Hers is a refreshing face that is not only natural, but quite charming as well. She has been away from the spotlight since Gossip Girl ended, but some photographer spotted her catching a flight at LAX yesterday. Most often than not, Jessica looks gorgeous on and off the red carpet. But for the plane ride, we think she may have gone a little too laid back for comfort. The actress donned some comfy boyfriend jeans and a slouchy sweater for the trip, then tried to pull the outfit together with a bright yellow printed headscarf. She wore the piece rockabilly style. Check out Jessica’s outfit and tell us if you like it. Well, any thoughts? Does she look chic or no? Did the scarf work its wonders? You know what? She really doesn’t look that bad, yes? Sure, she could have done better with the outfit, but you have to admit, the headscarf did its magic. It brightened up her bare face and added just a t0uch of color to keep her from looking washed out. It also made her look like a modern-day gypsy on the go. 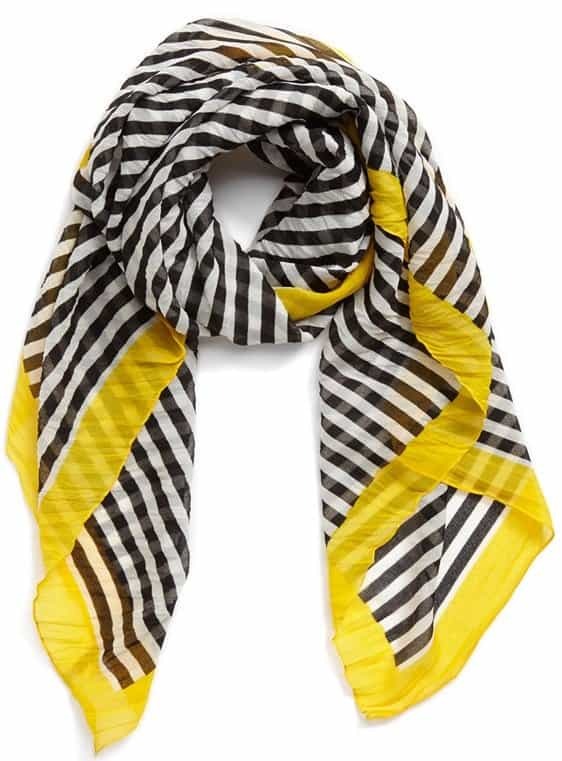 If you like Jessica’s plane-ride style and you want to steal it, do so with this yellow-detailed square from Nordstrom. It’s printed with black-and-white stripes at the center for an interesting touch. It also retails at an affordable $38. Wear it the rockabilly way and you’re all set. For more ideas on how to wear your square scarf as a head or hair accessory, check out the guides we previously published here and here.